It's a "spirited" thing to do at the spooky San Jose landmark. LIBATIONS THAT LEVITATE: It's impossible to not summon the phrase "spirits with spirits" when one is imbibing a glass of something grown-up and bubbly/foamy/potent in a spooky spot. The catchy line has long been used by the Ghost Hunters of Urban Los Angeles, in fact, whenever they planned an event involving cocktails in a rumored-to-be-haunted place (an event currently on hiatus, as of this typing, but charming nonetheless). Finding an eerie location in which to sip and socialize around California is not difficult, though, since our state is rife with storied structures, from hotels to train stations to historic restaurants. But one of the most storied of all was once a private home, lived in by one person, and is today visited by thousands each year. You know where we're about to land with this: It's the Winchester Mystery House, in San Jose, and along with San Diego's Whaley House, it's regularly billed as rife with spirits. Those spirits, however, don't just arrive in an ethereal form; beverages of the wine and beer and liquor variety are also served on the property. WINE TASTINGS... can be found in "a renovated original out-building with a unique wooden floor made from repurposed wine barrels." Where's this out-building? In the pretty, strollable courtyard of the mansion, just steps away from the main house's rambling corridors and staircases leading to nowhere. It's open seasonally, so if the idea of soaking up the Victorian-flavored tales and twists of Sarah Winchester's medium-influenced home, then following up with a merlot and chardonnay, appeal, check with the attraction before planning a day of house-touring and vino-tasting. BUT IF YOU WANT TO PEEK... at the tasting menu now, you can. There are Winchester Estate wines, made in the Santa Clara Valley, and some local beers from San Jose's own Strike Brewing Company. 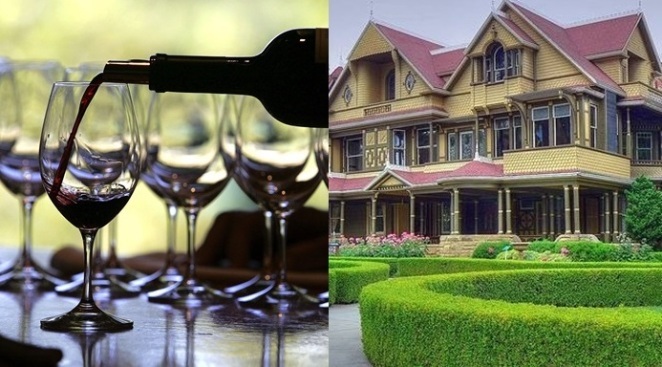 Is wine tasting at the Winchester Mystery House the most unusual place to pursue this oh-so-California tradition? There are some funky wineries out there, for sure, but few sit on the grounds of a haunted home, one that has windows in the floors and doors opening to brick walls. Eek.